You are here: Home / Articles / Politics / Party of the People? Or the Oligarchs? The Trump uprising, with a renegade capitalist serving as the tribune of the forgotten working class, appears headed toward an inevitable denouement. Trump’s intemperance, jingoism and lack of political skills have undermined the GOP’s ability to reach beyond its base in the South, the exurbs and parts of middle America. The Democrats should be able to easily overcome this collapsing regime, much as has occurred in California when the GOP managed to alienate immigrants in an ever more diverse state. An entire generation of young people, minorities and immigrants have been lost, and, almost by default, the Democrats are positioned to consolidate their power on a national basis. Yet Democrats’ identity is uncertain beyond being anti-Trump. Yes, they may be somewhat united pro forma on gender, race and cultural issues, but need to address their looming internal contradictions on key issues including class and geography. Ruling class or working class? In the past Democrats attracted large numbers of middle- and working-class voters seeking their fair share of the national cornucopia. But over the past 20 years they have become increasingly dominated by what historian Fred Siegel has called “an upstairs, downstairs” coalition, bringing together the most destitute with the most privileged parts of our society. Nancy Pelosi, the mega multi-millionaire from San Francisco, epitomizes “upstairs downstairs” politics of the party. Neither she nor President Obama threatened the ascendency of the tech oligarchs, in fact saving them from strong anti-trust action while raking in their generous political contributions. Some putatively left-wing candidates including Kamala Harris also seem anxious and willing to serve as their chosen tool. The oligarchs, after all, do “not have to rule,” notes historian Jeffrey Winters, but they likely will draw the line at such things as regulation, anti-trust and capital-gains rates that threaten their hegemony. Perhaps the Democrats will manage, as Franklin Roosevelt managed with white Southerners and northern liberals, to maintain this motley alignment. But as more Democrats favor socialism over capitalism, according to Gallup, there’s pressure for an ever more extensive program of “free” stuff. Higher taxes will be needed to fund the socialist agenda and this cannot be raised entirely from the super-rich, who are adept at avoiding them. As Tyler Cowen has pointed out, the big money will come from the same wealthy suburbanites — some of whom voted blue due to GOP policies taking away write-offs for local taxes — who now represent a larger proportion of their political base. Similarly, attempts to recover working-class voters, many of whom supported Trump in 2016, may prove difficult. The party’s increasingly aggressive green agenda almost certainly will hit hardest the manufacturing, energy and agricultural economies that have benefited under Trump’s economic policies. The quixotic ”green New Deal” to end fossil fuels by 2030, a goal widely discredited even by the likes of Bill Gates and Google engineers, could help Trump and the GOP maintain their primacy in a vast swath of the country. Attempts to build a fossil- and nuclear energy-free grid seems likely to raise the price of energy and force more basic industry elsewhere, as has already occurred in green hotbeds such as California and Germany. One has to wonder how the “green new deal” will play in the rustbelt of the Midwest and the manufacturing centers in the South, not to mention the oil patch that extends from Texas to the Dakotas. These areas, unlike California, cannot rely on tech oligarchs for cash if they de-industrialize. If Democrats are serious about deposing Trump, and the GOP, they should focus on pragmatic candidates such as Joe Biden, Colorado’s John Hickenlooper, Minnesota’s Amy Klobuchar or even Texas’ Beto O’Rourke. Moderation, even civility, no doubt will offend the intersectional PC crowd, but such well-positioned candidates could turn the GOP 2020 campaign into a modern version of Pickett’s charge. Sadly, pragmatism seems increasingly out of fashion among Democrats. Most of the leading candidates — Elizabeth Warren, Kamala Harris, Cory Booker — have been embracing a program of massive tax increases, ever more environmental regulation, the elimination of the fossil fuel industry, imposed high density and large income r-distribution. None of these are likely to appeal to suburban or small town voters. To be sure, most any candidate could defeat the consistently unpopular Trump, but long-term Democratic pre-eminence can only be assured by appealing to more than true believers. Successful Democrats, from Roosevelt and Truman to Bill Clinton, learned this lesson, and the party, and the nation, were better off for it. 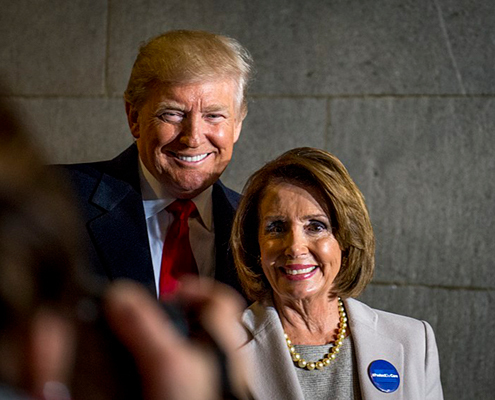 http://joelkotkin.com/wp-content/uploads/2019/02/President-elect_Trump_and_House_Minority_Leader_Nancy_Pelosi_012017.jpg 400 495 Joel Kotkin /wp-content/uploads/2017/01/jkotkin_logo.png Joel Kotkin2019-02-07 13:01:442019-02-07 13:01:44Party of the People? Or the Oligarchs?